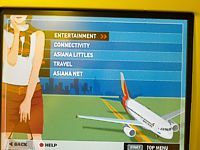 News: Asiana are adding video on demand for all classes, and giving personal video screens in all cabins. The roll out of this is slow. There are three systems of inflight entertainment for long-haul Asiana flights: you will either have AVOD or you won't. Plus, if you are really unlucky, you'll end up on a 747 with just a mainscreen entertainment system. It's basic, but servicable, however it doesn't come with niceities like a nose camera or inflight internet. New Boeing 777s with AVOD have again, two variants. The latest system has a selection of 30 movies and the same number of short films, while the older system has 9 movies and 15 short films. The AVOD is pretty good: you can stop and resume playback at your discretion, with the controls on the handset. Older 777s & 747s without AVOD just have the films on a loop: listen to the first inflight announcement and they will tell you at what intervals the films repeat at: this announcement is quite import because there is no onscreen counter or count down: the films just start when the crew want them to, and without it, you can miss the first 10 or 20 minutes. You can operate the films in two modes: if the handset says VID you can scroll through the channels with the Channel up and down buttons. 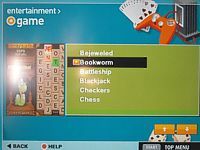 Or if you press the Mode button and put it into INT mode, the screen tells you what you are watching, but it's then harder to reverse out and select another channel. For non-Avod flights, the films are played out on tape, and this can wear very badly by the end of the month. You can send and receive the e-mail and SMS using the personal monitor and headset in the cabin of A330-300, B777-200 aircraft. It's quite pricey, with a usage fee per message of 1.5 US dollars You can also make a call to anybody on the ground using the satellite phone, at the quite extortionate rate of 2 dollars per 10 seconds. 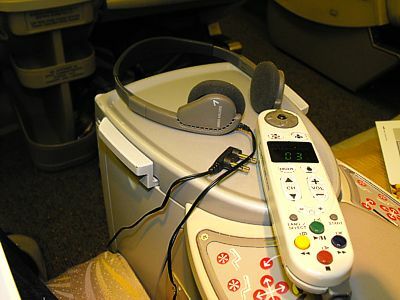 A 110V power supply is available for use with laptop computers, in Business class on the A330 and the B777, and all classes on the 747. It uses US style plugs. Headphones are a bit of disaster on all flights. The headphones are made by Sennheiser, but they are the same in economy and business, and are small uncomfortable things. There are no noise reducing headsets. On the ancient 747 combis, you may still get a system with 1980s speaking tubes: aviation, the way it used to be. Film selection is equally not great, particularly on non-Avod flights. There are just 5 English language films, or which one is a blockbuster (or, a film you have actually heard of) and the other four are non-descript also-rans from the Hollywood stable. Occasionally one of these films is replaced with a non-Korean foreign language film, reducing the selection to four. There are two separate banks of film selections: those for flights leaving Korea, and those heading to it, and they change every month. However if you travel out from say LHR to Sydney and back in the same month, by the time you finish your second long haul flight you will already have seen all the films, and then will have nothing new to see on the way back. You'll find two magazines in the seatbacks. The usual inflight magazine, and a separate magazine which lists the TV programmes. The main magazine is called Culture / Style / View, and comes in at hefty 120 pages. You are invited to take it off the plane. All the articles are in Korean and English, on the same pages. There are three main chunks to the magazine. 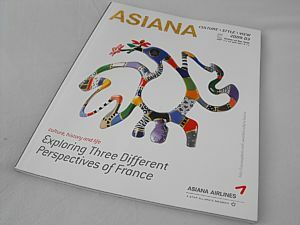 Culture has three or four articles to locations around the world (where Asiana flies to). Style has articles on hotels and fashion, plus, oddly, some cartoons. View has images, a long and rather tedious arts section, and features on photography. Finally at the back as the long information section, with the route maps, updates on Asiana, frequent flier information, guides on immigation and getting around Korea, details of Asiana's Magic Boarding Card plans, and a Quiz. 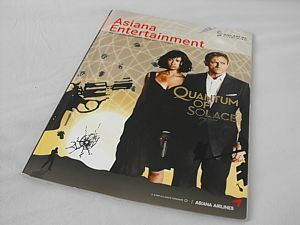 The Asiana Entertainment magazine lists exactly that, the inflight films and videos. Again, it is pretty lengthy. There is a long article on the main film, some fairly random articles, and then half way through the film listings. These have a small part of the page for each film with the synopsys, and then details for each flight. These are pretty confusing, and it can take some time to work out what you'll get on your flight. The vital pages you need are right at the back of the synopsys pages. These list three types of aircraft, and are either M (Mainscreen programme), B (Broadcast Programme) or A (AVOD). To see what type you have, there are pictures of the different types of the screen. Mainscreen programming is just on one page, and is pretty clear. It is followed by the listings for the separate Audio Channels. Broadcast is most confusing, split into two more sections depending on the type of monitor, with a page from Seoul, and to Seoul, and the grey bar at the top listing the destination, and then the separate channels. Finally there are the AVOD listings, although if you're lucky enough to have AVOD, you won't be wasting time reading the mag will you?